We’d love your help. 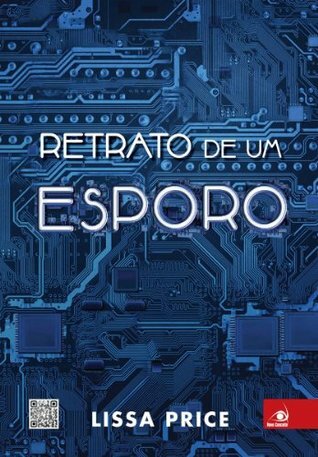 Let us know what’s wrong with this preview of Retrato de um Esporo by Lissa Price. Em Starters; descobrimos que a guerra dos Esporos dizimou a população. Adultos entre 30 e 60 anos morreram com esse vírus; inclusive a mãe de Callie. Neste conto; você vai conhecer a versão da história narrada pelo ponto de vista de um esporo; que pensa e divaga sobre sua missão de vir à Terra e acabar com os humanos que não tomaram a vacina. Um conto intermediário; lançado depois de Starters antecede o lançamento de Enders. To ask other readers questions about Retrato de um Esporo, please sign up. Uma curta visão sobre o fim do mundo que conhecemos. Mais um conto extra da série Starters e Enders! Não canso de repetir o quanto sou fã de contos... então deixe-me repetir para quem não costuma ler minhas resenhas: sou super fã de contos! Desta forma, é claro que fiquei ultra feliz por Lissa Price escrever tantos contos sobre o mundo dos Starters. Esse quarto conto Extra da série (que segundo a ordem informada pelo Goodreads deveria ter sido o terceiro a ser lido) se passa, na verdade, Uma curta visão sobre o fim do mundo que conhecemos. Esse quarto conto Extra da série (que segundo a ordem informada pelo Goodreads deveria ter sido o terceiro a ser lido) se passa, na verdade, antes de qualquer um dos outros. Apesar disso, não indico que a leitura dele seja feita antes do leitor conhecer a história de Starters. Retrato de um Esporo segue a nomeclatura de todos os outros contos da série. O primeiro, Retrato de uma Starter, tem um nome que casa perfeitamente com a história que é narrada, mas os demais apenas seguem a linha de título. Não que fique completamente fora, mas não casa tão bem como no caso do primeiro. Nesse conto, porém, o título não casa nem um pouco. A história narrada em Retrato de um Esporo até conta com o ponto de vista de um dos esporos bacterianos responsáveis por exterminar grande parte da população humana (mas, querido leitor, não se empolgue! A autora não conta nada sobre a guerra! Apenas diz que são os países do Pacífico - sem especificar quais seriam ou seus motivos - que lançaram os esporos sobre os Estados Unidos). Mas a principal parte do conto - que é também a mais interessante - é narrada sob o ponto de vista da mãe da protagonista dos outros livros. Na mesma linha dos demais, é uma narrativa bem curta. Uma leitura agradável e super rápida que faz com que o leitor que gosta da série sinta mais um pouquinho do mundo de Callie. De todos os contos é, na minha opinião, o mais fraco. Principalmente porque o título me prometia mostrar mais do que mostrou. Ainda é interessante, mas eu queria mais sob o ponto de vista distópico - queria saber mais da guerra, queria mais detalhes sobre a doença... enfim, eu queria mais e não obtive, talvez por isso esse conto tenha soado para mim menos interessante do que os demais. A Novo Conceito repetiu com esse a mesma fórmula dos outros volumes, disponibilizando o conto gratuitamente na internet (clique aqui para fazer o download). Para quem curte a escrita de Lissa Price, é uma leitura que vale a pena! Mas não precisa ler na ordem não! Eu li os três contos intermediários após a leitura do segundo livro sem que houvesse qualquer prejuízo na leitura. -Stakes: Between her writing style in both novel and short story length, I've come to appreciate Lissa's brand of developing a crescendo. A good story, no matter how short or long, tends to involve each scene getting worse for the characters. Oh boy, does this do it. -Upsetting: Now, that sounds bad, but its good....let me explain. The setting of this is a T-minus X countdown of the bomb that affects Callie's life. You already know what's going to happen, so the ticking time bomb element creates excellent suspense. The fantastic thing is that while the spores are the true machines of death, the villains here aren't the belligerents of the war, at least not up close. The villains rest in a society--scared out of their wits and desperate for security. Like Lord of the Flies, but interesting. Portrait of a Spore is a super short story that at the end of the Starters paperback edition. It's written in two point of views: a Spore and Callie's mother, Barbara Woodland. I thought it was a bit weird for the spore to have its own thoughts and found that part of the story a bit boring. However, I did enjoy getting to know Callie's mother a bit. Like Callie, she's strong, loving and protective. The short story takes place the day that the spores hit. We're able to see what Callie and her mom Portrait of a Spore is a super short story that at the end of the Starters paperback edition. It's written in two point of views: a Spore and Callie's mother, Barbara Woodland. I thought it was a bit weird for the spore to have its own thoughts and found that part of the story a bit boring. However, I did enjoy getting to know Callie's mother a bit. Like Callie, she's strong, loving and protective. The short story takes place the day that the spores hit. We're able to see what Callie and her mom did the day of the spore attack. Although in Starters we were able to see a glimpse of what happen in Callie's point of view, but it was really interesting to see it through Barbara's eyes. I loved that I was able to feel her regret for leaving her children behind and the realness of her wanting the vaccination even though that might not have been the 'moral' thing to do. Portrait of a Spore is a good addition between books one and two in the Starters series. Even though I thought the whole Spore being self aware and having an inner dialog was a bit weird, I thought Callie's mom point of view was really awesome. It was interesting to see the Spore Wars and even Callie through Barbara Woodland's eyes. i think this story is totally unnecessary since it didn't really give any significant details explaining the situation only establish the plot in another POV. it's basically an account of what Callie and her family were doing at the time of the release of the spores. i feel like this story really didn't contribute anything to the first book (Starters) since in there we already knew the important part about what happened to Callie's parents. the parts which were written in the POV of the spore cre i think this story is totally unnecessary since it didn't really give any significant details explaining the situation only establish the plot in another POV. it's basically an account of what Callie and her family were doing at the time of the release of the spores. i feel like this story really didn't contribute anything to the first book (Starters) since in there we already knew the important part about what happened to Callie's parents. Questo sì che è un prequel! Ecco, se c'è una cosa peggiore di tagliare in due l'ultimo film di una saga, è fare dei prequel vuoti e senza senso. E ultimamente ne ho letti molti. In poche pagine, riesce a concentrare un mondo in grado di coinvolgere il lettore. E devo ammettere che il doppio punto di vista di questo mi ha stupita. Da una parte Barbara, madre che teme per il futuro dei suoi figli, e dall'altra le Spore. O meglio, la Spora. è qualcosa di strano e originale al Questo sì che è un prequel! Da una parte Barbara, madre che teme per il futuro dei suoi figli, e dall'altra le Spore. O meglio, la Spora. è qualcosa di strano e originale allo stesso tempo; un pò azzardato ma nell'insieme ben riuscito. This short story is told from the alternating perspectives of Callie's mom, Barbara, and the spore that caused her death. It chronicles the day Barbara was contaminated by the spore. It was heartbreaking to hear her thoughts on what would happen to her children in a future that seems so uncertain. Her fear is evident throughout the story, as is the desperate situation of their world. Chaos has begun and all Barbara wants to do is protect her daughter and make one more memory with her b This short story is told from the alternating perspectives of Callie's mom, Barbara, and the spore that caused her death. It chronicles the day Barbara was contaminated by the spore. It was heartbreaking to hear her thoughts on what would happen to her children in a future that seems so uncertain. Her fear is evident throughout the story, as is the desperate situation of their world. Chaos has begun and all Barbara wants to do is protect her daughter and make one more memory with her before everything goes to hell. Telling the Spore's side of the story, and knowing how they think, how they feel and what they know- what they do. Then we have Callie's mother too, her part of the story, and what she feels and thinks and tries to do. Number one checkpoint on your to-do list- keep your family safe. The beginning of it all, and I'm very happy it was at the end of this book, I'm glad I read this after reading the official first story. It makes it more intriguing. Very interesting, and well done! an interesting take on a prequel. I liked getting to see the MC's mom and her worries before the spore outbreak and what the world was like. Her worries and how she tries to shield her kids while preparing for the future. I'm conflicted on the view of the spore, its hard to let a bacteria have thoughts and feelings, but it was interesting. Simplemente me encanto esta historia corta. Apesar de ser solo 30 paginas, Lissa Price transmitió en mi la misma sensación de starters; querer saber mas, no poder soltarlo, emoción, angustia. Que este contado desde el punto de vista de la mamá de Callie y de una Spore, me pareció excelente. Ein Blick in Callies Vergangenheit zu haben war schön und auch gleichzeitig viel zu traurig für mich :( Dennoch war es schön Callies Mama kennenzulernen und die beiden Hauptbücher weiter zu verstehen. This book is a bit boring and I can't believe that a spore can have a POV. Wow, that's new. Well here we can see Callie's mother, Barbara Woodland's point of view before and during the accident. Like Callie, she's loving, caring and very protective. That's all. Thank you. Ahh, das bringt schon ein wenig mehr Licht ins Dunkle, was die Vorgeschichte betrifft. Screw their purpose. That was just, ugh. noooo. why did you have to tell me how she died? that's not fair! it was so close. And the spore found his destiny. She was so beautiful. DEAD WAS CALLIE'S MOTHER, BARBARA WOODLAND. Odd little add-on to the Starters Book, but it gives a little more background to the main character. STARTERS was a Barnes & Noble pick of the month and one of only four debuts on the B&N Best Teen Books of 2012. It was awarded the its Eselsohr for Best YA Book in 2012, selected by a jury of teens in Germany, and was chosen as a top ten favorite book of 2012 by both French and German readers. It won the Crimezone Award for Best YA Thriller and is one of the LAPL's and Chicago Public Library's Best Teen Books of 2012. Starters was chosen for the IRA Reading List and is the only book nominated for both the Florida Teens Read List and the SSYRA Middle School List 2013-14. In Germany, Starters launched a brand-new YA imprint of the established Piper Verlag publisher called IVI. Audiobooks have been recorded in English and German. See the book trailer that played in front of the Hunger Games film in selected theaters in the US and abroad at her site. The release dates for Enders will be announced by the publishers of each country, with some starting in May 2013. If you want to contact Lissa, please do it through her website, fb, twitter or tumblr and not here. She's happy to email you back if you reach out to her that way. She thanks everyone for their support!